During afternoon rainstorms, you see it. As snow melts during the winter, you see it. Every time you look outside, you watch the slow drip from your gutters where they rusted through years ago. In fact, it’s not just one spot; you can easily point out several unique drip points around your home. While this may not seem like a big deal, in reality, it’s essential that you take care of your gutters and provide them with any gutter repair they may need. Have visible holes in them. Are pulling away from your house. Are missing nails or facets. While it may seem easy to provide your home with DIY gutter repairs, it’s not the best idea. Between the risk of falling while trying to get up on your roof, and often the need for specific products, professional gutter repairs are going to last longer and be worth the little bit of extra money. Here at Sorensen Roofing & Exteriors, we want to provide you with the services and products that your home needs. This can often include repairs that are more cost effective than replacements. If you don’t need new gutters and a few repairs will do the trick, we want to help you with that! 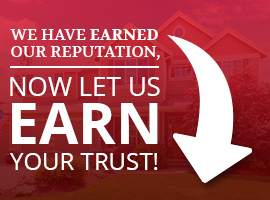 Our goal is to always put the customer first with honesty and integrity, and this even includes your gutter repair services. So when you need gutter repairs for your Northern Colorado or Front Range home, just give us a call here at Sorensen Roofing & Exteriors!